One of the things I’ve had learn to do on this being-published journey is something much more challenging than writing. Writing is a joy – my safe place, somewhere I’m comfortable, something I feel confident about, love. But when your work goes out into the world, you have to go there as well. And that means public speaking. This has terrified me all my life. It’s something I’ve avoided wherever possible. Something that makes me sweat and stutter and blush and feel nauseous. When I was doing my A levels I chose English Language, English Literature and Theatre Studies. I picked the latter to learn stage writing, but of course it involved studying all aspects of the stage; writing, acting, costume, directing. On our first day we had to break the ice by going around the circle and speaking about who we were, and who we thought the two people next to us were, and do each in a different accent. Seems such a simple, almost silly, task now. But I froze. I just wanted the ground to swallow me up. I couldn’t do it, and the teacher moved on with ill-disguised judgement in his eyes for this pathetic creature who couldn’t even open her usually chatty mouth. I gave that A level up the next day and stuck with English. Written words were wonderful in that I could hide behind them. People have often assumed because I’m quite the chatterbox that I’d find public speaking a natural thing to do. A thing I might enjoy. No. It wasn’t. But I’m getting there. Slowly. I kind of knew I’d one day have to face it if I was to fulfil my dream of being published. So I started small. I volunteered at a local community radio station with a couple of friends and took part in a weekly show. This meant I was speaking publicly but without having anyone actually watch. When you’re in a studio, hidden, it’s easy to pretend it’s just you and your gang, having a gossip. But I learned to speak more slowly, to think about what I said (only one complaint when I used the word bush inappropriately) and to share the air space. This naturally led to the Mums’ Army slot at BBC Radio Humberside, where I grew more confident alongside my wonderful pals, Claire, Fiona and Lesley, and with the guidance of presenters, Lizzie and Carl. Still I had to learn to face a physical audience though. I first did this at an event for International Women’s Day in 2014 when I read an extract of my then work in progress, How to be Brave, at the library. I won’t lie – I drank at least three large swigs of whisky in the toilet beforehand. As I sat and waited for my turn I kept thinking, pretend to faint, say you’re ill, leave, anything to avoid it. But I did it. I did it and lived. Perhaps it wasn’t quite as bad as I’d anticipated. Once How to be Brave and then The Mountain in my Shoe came out I had to do all manner of readings and launches and interviews. But the radio work had prepared me a little. And I suddenly realised, quite profoundly, that when you talk about something you love, it’s that much easier to do it. Part of my fear of speaking in public was the fear we all have; of making a mistake, of sounding foolish, of looking like an idiot, of being boring, of appearing stupid, of looking out into disinterested eyes, of being criticised. As a child I was criticised a lot. It was a familiar thing to me so you might imagine I would therefore be used to it, not fear it. But negative experiences don’t make us any better at dealing with them. Husband Joe recorded my chat with Michael J Malone at my London book launch. I didn’t want to watch it. Thought if I did it would only add to my fear. Make me see that it was true, I looked a fool. But I decided I could maybe learn something about my mistakes. It was a strange experience. I wasn’t sure who this person was who didn’t look all that nervous, who seemed to know what she talking about, who did quite okay really. Again, it must have been because I was talking about something I felt passionate about, and so I forgot about my nerves. 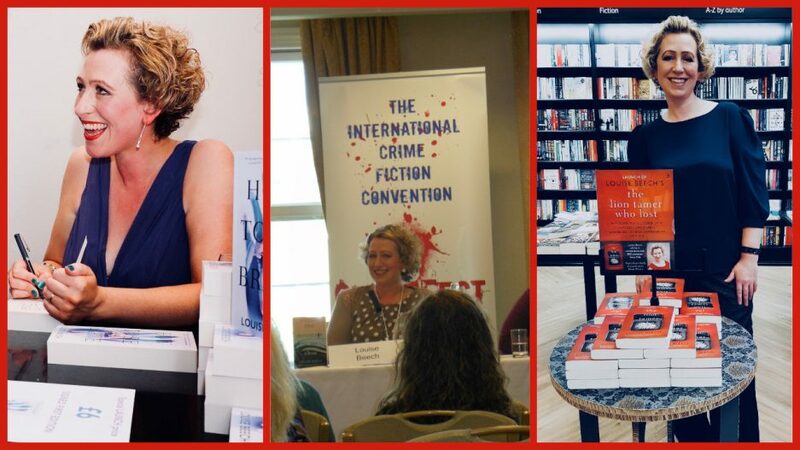 When recently my editor and publisher said they were proposing me for a big TED-style Talk as part of Harrogate International Festivals my first instinct was to say no. I almost typed no straight away. Not just no, but no way. Absolutely never. Who’d want to watch me for thirty minutes, rambling on. All my insecurities came back. My daughter was home so I said to her, ‘If I ask you something, will you answer me honestly? Not kindly or telling me what you think I want to hear, but honestly?’ She said she would. I knew she would. She’s sixteen. She generally likes being brutally honest with me. I asked if she thought an audience would find me remotely interesting if I were to talk for thirty minutes on creativity and inspiration. Without pausing, looking me directly in the eye, she said yes. So I said yes to the talk. I may not get chosen. And if I do I won’t sleep until it comes around. But I said yes.